Any chance we can get a modded bios 1.31 with some basic LED control - like on/off, set a color? Thanks! Last edited by 1usmus; 03-06-2019 at 10:12 AM. OMG- nice, but now 15K looks so close :-). Also Be ready TR 3000 is officially coming in few month in 2019 :-). Thanks for the info ...impressive results on the 2990WX and its cooling. I caved in and put my 2080ti FTW3's under water. Now my loop looks like this: Dual D5 pumps -> 2990WX with XSPC TR4 block --> XSPC EX360 rad ----> 1080 Phobia Nova ----> 2080ti's ---> XSPC RX360 -----> back to rez. ...sounds like a very nice setup ! What with your 2x 2080 Tis (which combined can push approx 600w to 760w heat energy) plus a 2990WX, you should get some breathing-room on temps (depending of course also on case, fans etc). 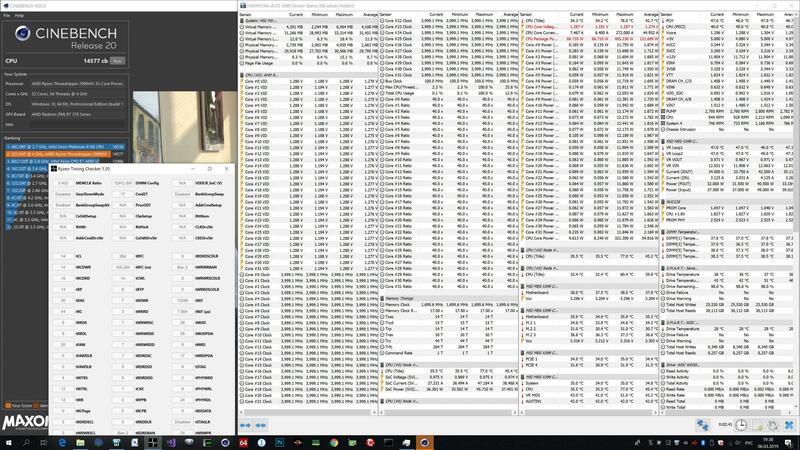 MAXON CINEBENCH R20: Threadripper 2990WX results! May is for Ryzen 3000. TR3 I'd say more like September.